Having finally found his confidence, Roberts is thriving at left tackle in Trey Adams' absence. Once the All-Pac-12 tackle returns, however, Roberts could play a significant role next season, perhaps as the versatile sixth man on the line. Confidence, Henry Roberts says, has been the greatest factor in his breakthrough on the Huskies offensive line this spring. He believes he belongs among the best five linemen and, in turn, coaches are showing a strong belief in him. “In the first three years I was here, I kind of identified with a high-school offensive lineman,” said Roberts, a 6-foot-6, 313-pound fourth-year junior. “Because when you come in and you have Kaleb McGary and Trey (Adams) and these guys who have come in and are starting right away and they’re just freaks in how big they are. One of the most improved players on the UW offense, Roberts has taken all of the reps with the first-team offense at left tackle this spring. It is, he knows, a temporary job. Adams, a first-team all-conference selection in 2016, is on track to return from a torn anterior cruciate ligament for the Sept. 1 season opener against Auburn. Roberts is eager to welcome Adams’ back at left tackle. Even when Adams returns, Roberts has shown enough this spring to think he could play a significant role next season, perhaps as the versatile sixth man on the line. One of the highest-ranked recruits in the 2015 recruiting class, Roberts had a stellar career in Bellevue wing-T offense, helping the Wolverines go 41-1 with two state titles in his three years on varsity. Expectations were high for him to step in early and be a mainstay on the line. As he explained, it took him time to get comfortable in the Huskies’ system, and to build confidence in himself. This winter, he added almost 20 pounds of bulk, and he’s ready to contribute wherever he’s needed. Junior Nick Harris, the Huskies’ starting right guard last season, has made a smooth transition this spring to center. 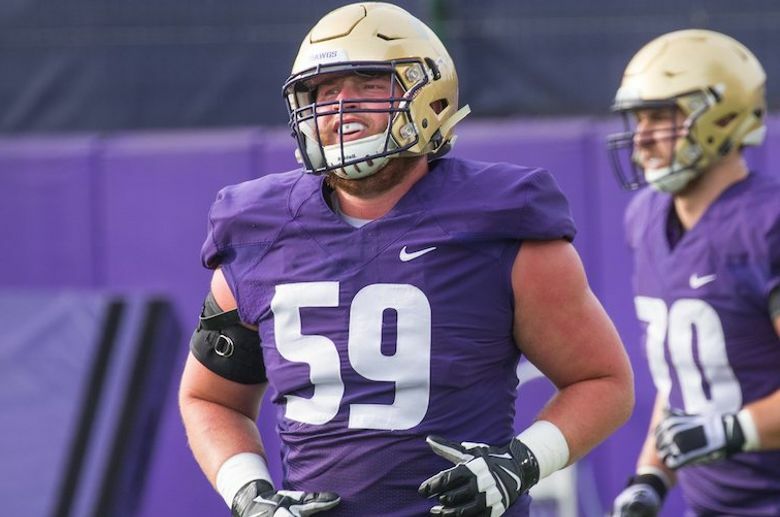 In 2016, Harris became just the second true freshman Chris Petersen has ever played on the offensive line (following Adams in 2015), and he lined up as a starting guard against Alabama in the Peach Bowl weighing just 270 pounds. He’s now closing in on 300 pounds — a big goal for him — and he’s growing also as the new voice of the line. Huff has also singled out senior Matt James, another versatile linemen who gained weight this winter (he’s up to 300) and has been the regular right guard with the No. 1 offense this spring.